I found this recipe in a magazine the other day and decided to try it. It was a hit! 6 Servings of about one cup each. 1. Preheat oven to 350 degrees. In a small saucepan heat oil over medium heat. Add flour, stirring until smooth. Stir in tomato sauce, broth, chili powder, oregano, cumin, salt, cinnamon, and cayenne pepper. Cook and stir until thickened and bubbly. Cook and stir 1 minute more; set aside. 2. 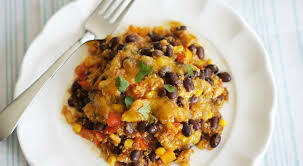 In a medium bowl combine black beans, pinto beans, onion, sweet pepper, and diced green chile peppers; set aside. 3. Coat a 2-quart baking dish with cooking spray. Drizzle 1/2 cup of the tomato sauce mixture on the bottom of the prepared baking dish. Layer one-third of the tortilla wedges on top of the sauce. Top with one-third of the bean mixture. Drizzle one-third (about 2/3 cup) of the remaining sauce over all. Srinkle with 1/4 cup of the cheese. Repeat layers twice, starting with tortilla wedges, except do not add the final layer of cheese. 4. Cover with foil. Bake 35 minutes. Sprinkle with the remaining 1/2 cup cheese. Bake uncovered, about 10 minutes more until cheese melts. Serve with Greek yogurt and taco sauce. *Instead of two kinds of beans, I added about ¾ pound of browned hamburger. Check out my book, Family Favorites from the Heartland available at Amazon.com.